some clicks of the newbie on road. 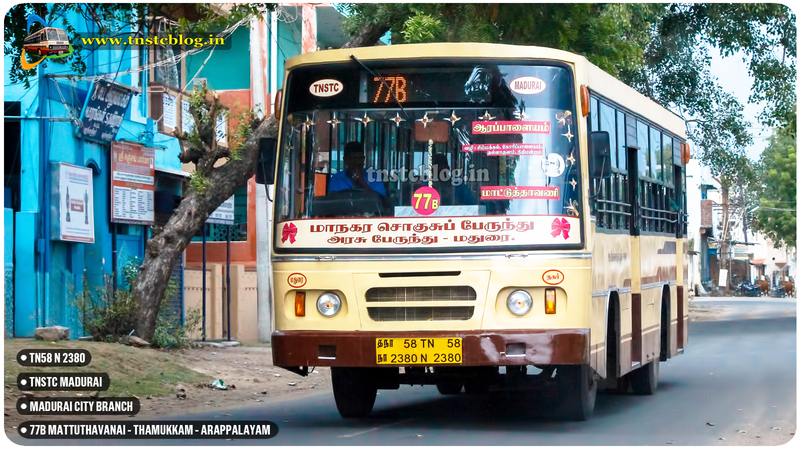 TN58 N 2378 of Ponmeni Depot Route 77BA Mattuthavani – Arappalayam via Anna Nilayam, Goripalayam, Simmakal. 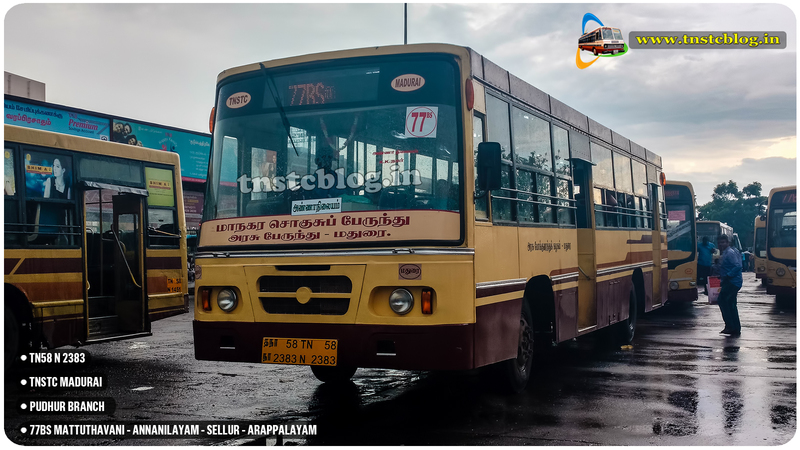 TN58 N 2379 of Ponmeni Depot Route 77BS Mattuthavani – Arappalayam via Anna Nilayam, Goripalayam, Sellur. 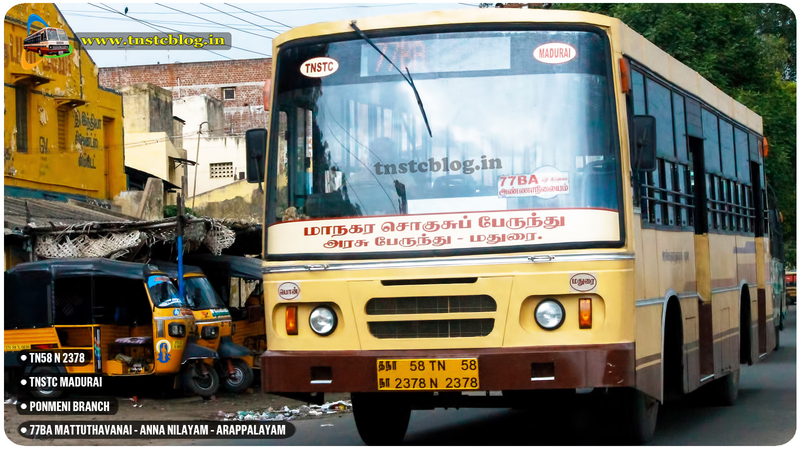 TN58 N 2380 of Madurai Nagar Depot Route 77B Mattuthavani – Arappalayam via Thamukkam, Goripalayam, Simmakal. 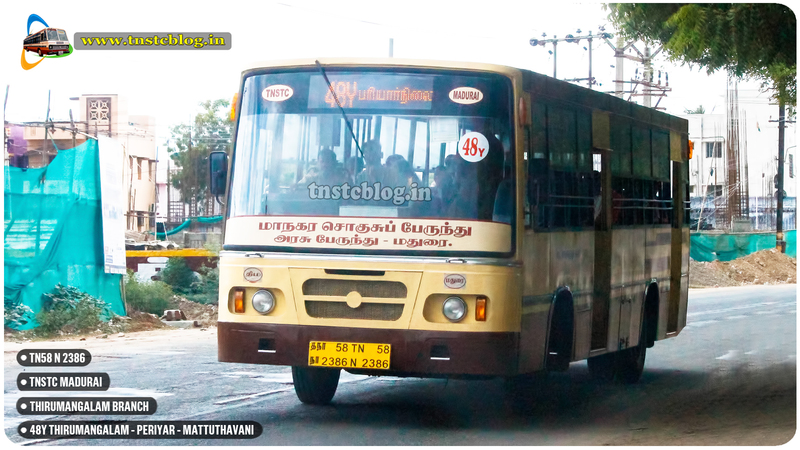 TN58 N 2381 of Madurai Nagar Depot Route 48AD Thirumangalam – Arappalayam via Thiruparankundram, Pasumalai, Bypass, TNSTC HO. 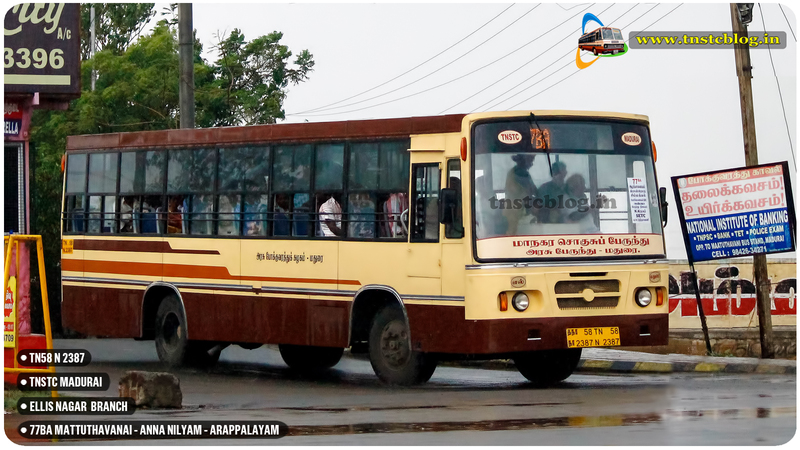 TN58 N 2383 of Pudhur Depot Route 77BS Mattuthavani – Arappalayam via Anna Nilayam, Goripalayam, Sellur. 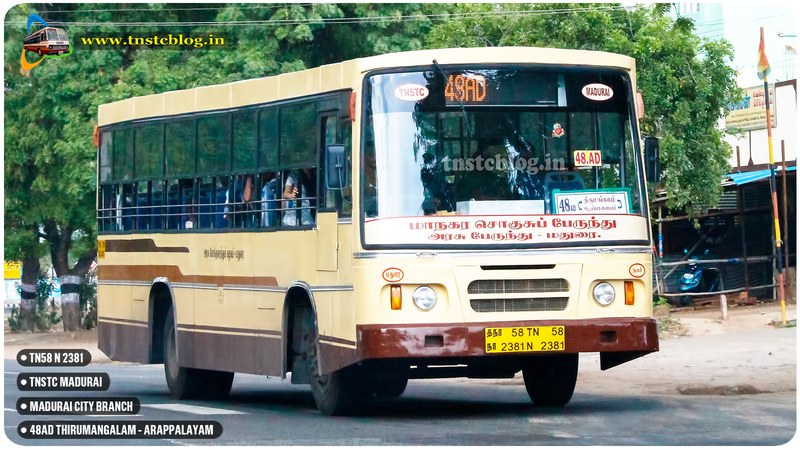 TN58 N 2386 of Thirumangalam Depot Route 48Y Thirumangalam – Matuthavani via Thiruparankundram, Periyar, Simmakal, Goripalayam. 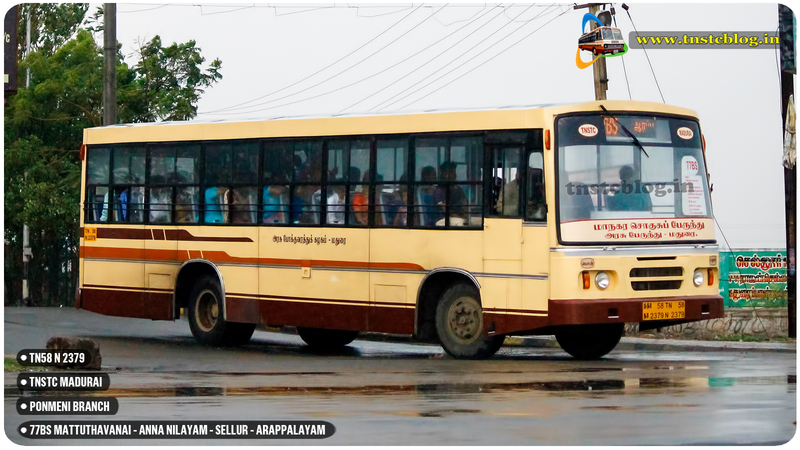 TN58 N 2387 of Ellis Nagar Depot Route 77BA Mattuthavani – Arappalayam via Anna Nilayam, Goripalayam, Simmakal. 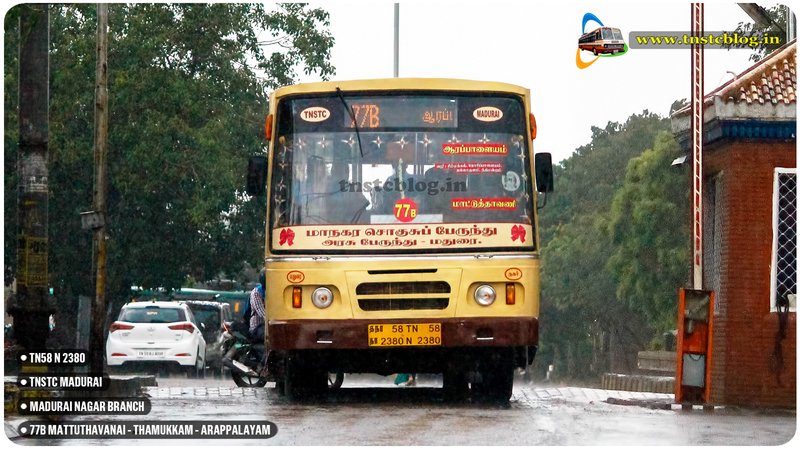 TN58 N 2388 of Thiruparankundram Depot Route 77BA Mattuthavani – Arappalayam via Anna Nilayam, Goripalayam, Simmakal. 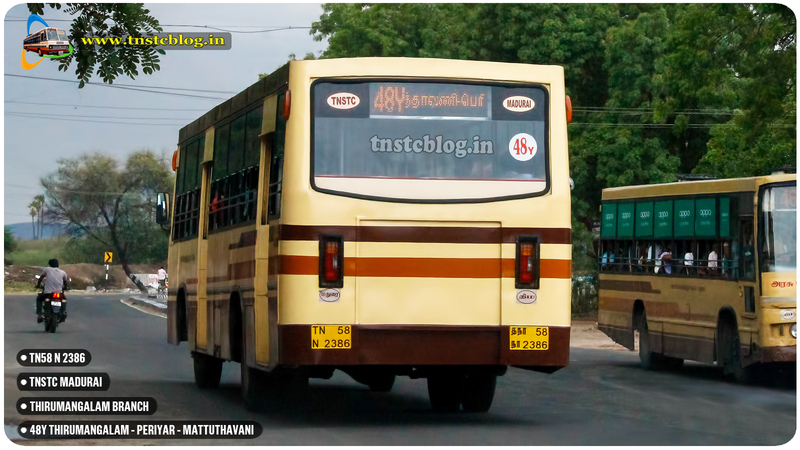 Sir, It is really a joyful one to note that few new buses are introduced at Madurai city. 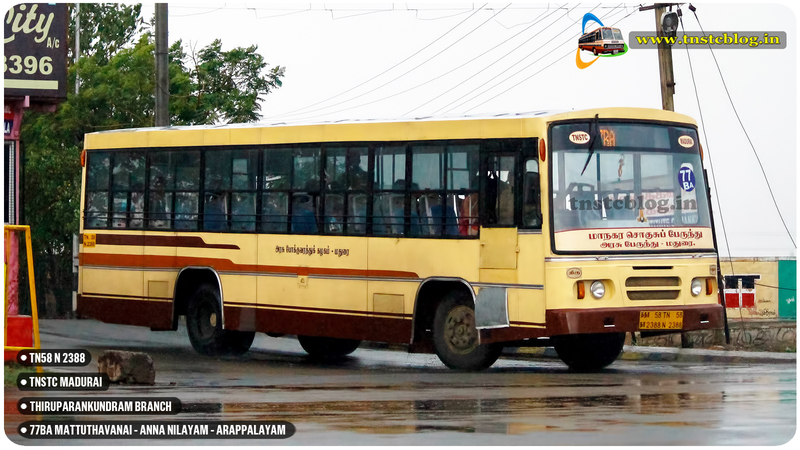 But we request you sincerely to introduce Minibuses in Madurai city as already promised by the Honourable C.M.Sri Edappadi PalaniSamy. Our late Honourable C.M. Amma also assured the introduction of Minibuses in Madurai Roads while inagurating Minibus service at Chennai Suburban areas. Thank you sir, Yours sincerely Palanivel.